A decade ago, the Dixie Chicks released their fourth album, Wide, Open Spaces , which quickly propelled the all-girl trio to the top of the billboard charts and, a year later, won a Grammy for best country album. In the title song, vocalist Natalie Maines sings of “a place out west,” of the yearning to explore and to discover the American Dream. These lyrics echo sentiments that have remained engrained in Americans for centuries. From 1843 until the completion of the transcontinental railroad in 1869, more than a half-million pioneers migrated west in search of land and opportunity. Even today, not far away from the smog and traffic congestion that plague many West Coast cities, there exists countryside with open sky and ample room to stretch one's arms. Umatilla County is such a place. Located in northeastern Oregon , along the Washington border, the county is the thirteenth largest in the state, and portions of it lie along the famed Oregon Trail . A largely agricultural region, Umatilla County is one of the nation's leading wheat and green pea producers. Tourism also is becoming increasingly important as more and more urbanites escape city life to commune with nature in Umatilla County 's scenic Blue Mountains and paddle the Columbia and Walla Walla Rivers . 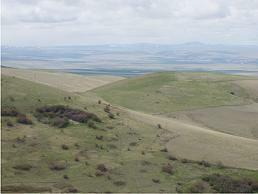 Photo Right: Oregon 's Blue Mountains overlook Southwest Rural Neighborhood Watch country. Unfortunately, the very qualities that make Umatilla County a great vacation destination and year-round home also attract an unwanted criminal element. With fewer than 73,000 residents, an expansive 3,231 square miles of land, and several major highways crossing through, the county until recently was a haven for drug runners, methamphetamine lab operators, and other law-breakers who knew that their chances of being apprehended by one of the few local law enforcement officers were slim. 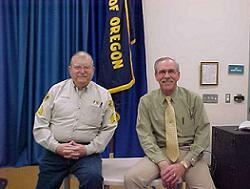 “Most rural counties average 1.5 to 1.8 deputies per 1,000 people,” explained Umatilla County Sheriff John Trumbo. “We are at .36, and we've been at this level for about 12 years. The bad guys know we don't have 24-hour patrols.” Troubled, Sheriff Trumbo launched a crusade to reverse the crime trend, and, in the less than three years that the county's Neighborhood Watch program has been running, the county has seen a dramatic drop in crime. Faced with a budget deficit that prevented him from hiring more deputies, Sheriff Trumbo, a 35-year law enforcement veteran, knew that he and his staff alone could not successfully combat the escalating crime problem. Such an effort would require the commitment of the entire community—the farmers, ranchers, and others who lived in the remote areas where crimes typically occurred. “I had always wanted a crime prevention program for Umatilla County because I believe we need to work directly with our citizens to solve the problems we have,” Sheriff Trumbo said. “The problem is, with any crime prevention program, you must have a coordinator who is willing to put in the time needed. That person has to have great people skills. Also, the public has to know that he or she is sincere in the desire to make things better.” Enter Sergeant Greg Hodgens. Hodgens came to the Umatilla County Sheriff's Office with an impressive resume that included experience in city, state, and federal law enforcement; corrections; and security. Although prior to accepting Sheriff Trumbo's offer he had never been directly involved with Neighborhood Watch, he used proven models upon which to base the RNW. “While working for the Multnomah County Sheriff's Office, I got the chance to see how the Portland Police Department operates its Neighborhood Watch program,” he said. Hodgens also gleaned information from the Internet and turned to the National Sheriffs' Association for guidance and training, making extensive use of the association's Toolkit. Two keys to the RNW's continuing success are the organization's intensive screening and training programs. 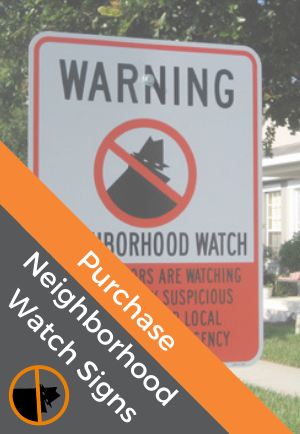 There is no minimum size requirement for groups interested in forming a Neighborhood Watch. However, all prospective members must submit to a background check. 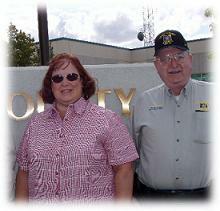 While certain felony convictions can be grounds for refusal of membership, Sheriff Trumbo and Sergeant Hodgens often will interview applicants with blemished police records to determine if past troubles have been resolved and if the individuals are sincere in their desire to participate in RNW. When a group's application is complete, important information such as members' geographical addresses, crossroads, and license numbers, are entered into a database for emergency use, and each group member is issued an identification number that starts with the first letter of his or her unit's name (e.g., “J” for the Juniper Unit). New members are tasked with learning the number and color of vehicles within their unit and other details that could prove useful in emergencies. 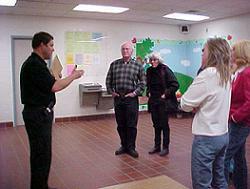 Photo Right: A Rural Neighborhood Watch unit tours the Umatilla County Correctional Facility. Once new members complete their mandatory training courses, they are treated to an open house/graduation ceremony hosted by the sheriff's office. As part of the ongoing commitment to support its volunteers, the sheriff's office also provides specialized training to Neighborhood Watch groups upon request. Law enforcement professionals with expertise in subjects such as child neglect, domestic violence, and sexual abuse are available to provide training tailored to individual group needs. Several RNW units have had the opportunity to hone the evidence-gathering skills they learned during their initial training thanks, in part, to a new state law. Oregon Statute 105.550 grants individual homeowners the right to sue for personal damages and suffering neighboring property owners whose homes are the scene of illegal activity. Typically, after Watch volunteers have monitored and documented suspicious happenings, they send letters to the district attorney, the mortgage company of the home in question, and the property owner notifying these parties of their intent to file suit. Through meticulous documentation, one Blue Mountains RNW unit recently was successful in closing a drug house that was disturbing the tranquil vacation community. After law enforcement officers raided the house, unit members teamed up to beautify the area. They then set to training a group of youth volunteers, who now clean and maintain the site throughout the year. Another RNW unit in Umatilla County 's tiny Meacham community, population 100, is celebrating a similar coup. Watch members suspected a neighborhood property of illicit activity when strangers began showing up and leaving minutes later and returning at regular intervals. Members also observed property being taken into the house that didn't seem to belong. Over time, the unit gathered sufficient evidence for law enforcement to obtain a search warrant. During the subsequent raid on the property, sheriff's deputies arrested two suspects, seized four stolen guns and other property, and solved crimes related to a previous burglary. 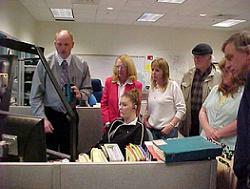 Photo Right: Communications Sergeant John Shafer describes the workings of the Umatilla County 911 Dispatch Unit to new members. The RNW evidence-gathering and letter-writing technique has been so successful that mortgage companies have inspected and repossessed certain properties for owner violation of the mortgage contract without the need for court intervention. RNW units are now attempting to get a new universal county property ordinance passed that would declare specified crime properties to be a nuisance and give the court power to temporarily seize them. As the RNW expands, the need for communication and interaction between individual members, units, and the sheriff's office is increasing. In response to this need, the sheriff's office has established a new program whereby members may volunteer as liaison officers. After completing training, liaison officers visit other RNW members, as well as nonmember ranchers and farmers, to share crime prevention expertise and raise awareness. “Our liaison officers will be an extension of the sheriff's office, essentially establishing a presence in remote areas and obtaining first-hand information on possible crime activity in the areas they visit while sharing a cup of coffee with the people they visit,” Hodgens explained.